Explore various vegetation indices and composite images generated from the orthomosaic reflectance map. This sample data was collected from 400 ft AGL with a resolution of 8.2 cm per pixel. Samples containing the unprocessed output files, as they are captured by the camera, one 16-bit RAW TIFF file per band (based on 12-bit data) (five images). 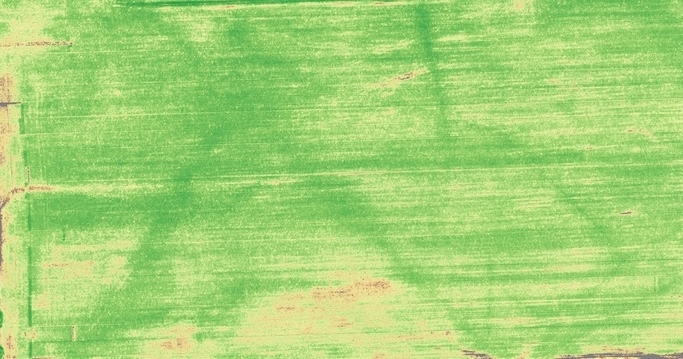 This sample data was collected from 400 ft AGL with a resolution of 8.2 cm per pixel. This is data from an actual flight. It shows early growth of a cover crop (roughly 3" to 6" growth). The cover crop is thin, but emergence consistency (or lack thereof) is visible. It was flown with 80% overlap at 200 ft AGL, with a resolution of 4 cm per pixel. It can be stitched in Pix4D or other photogrammetry solutions. This is a fully processed output in GeoTIFF format. This sample data was collected from 400 ft AGL with a resolution of 8.2 cm per pixel.These files contain reflectance-calibrated bands normalized so that a pixel intensity value of 32768 corresponds to 100% reflectance for each band. Each layer of the GeoTIFF file is registered to all others at the pixel level. Note that these images may not open correctly in some image viewers. They are intended to be viewed using GIS software (ArcGIS, ArcMap, QGIS ...).